First Marc Goodwin wrote a blog detailing his version of the events. Then Phil Ivey, through his good friend Daniel Negreanu, responded via Daniel Negreanu's blog. And now Ram Vaswani has responded with his version of the story. It is not surprising that everyone seems to have their own version of how the event went down. Here is what we know, based on interviewing various sources. A good number of professional poker players also play golf in their spare time. Because they are professional gamblers, naturally they prefer to play with some money on the line. Because they are degenerate gamblers, there is often LOTS of money on the line. Recently in Australia, a golf game took place that involved Phil Ivey, Ram Vaswani and Marc Goodwin. Goodwin and Vaswani are both very good golfers, with Ivey being a bit of a hacker, but a hacker who is rapidly improving. 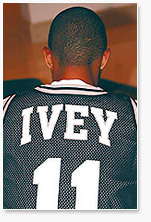 Because Ivey is quite a bit worse than the other players, he will get strokes. So, for an average round, Ivey may get ten strokes, in order to even up the game. According to rumors, over the past three months, Ivey had been practicing quite a bit and employing some golf pros to help with game, thus improving his score quite a bit. The story goes that Vaswani and Goodwin asked Ivey if he had been playing much lately, and Ivey said no. They still couldn't agree on strokes, and finally they agreed that because Lindgren had recently given Ivey 10 strokes in a game they had recently played, that that would be the number of strokes Ivey would get. And with that, they were off. Over the course of 72 holes, Ivey destroyed the other players, leaving them owing 1.8 million dollars, with Vaswani owing the largest amount at $900,000. Word has it that Marc Goodwin stormed off after several holes, refusing to pay, while Vaswani finished up. Vaswani and Goodwin refused to pay, saying that they had been conned and that Ivey was a much better player than he had let on. Ivey said, no one forced you to play, and you could have stopped at anytime once you realized that you were going to lose. The players involved actually tried to settle this issue in Monte Carlo, even involving Barry Greenstein as a mediator, but nothing was solved and there are obviously some bitter feelings and friendships have been lost. So who is right and who is wrong here? Should Ivey have been more forthcoming about his recent golfing? Should Vaswani have just quit the game once he realized that he was getting killed? Should Vaswani and Goodwin be forced to pay?